The City of Davis Bike and Pedestrian Program and Safe Routes to School Program and other partners are hosting events throughout the fall months. 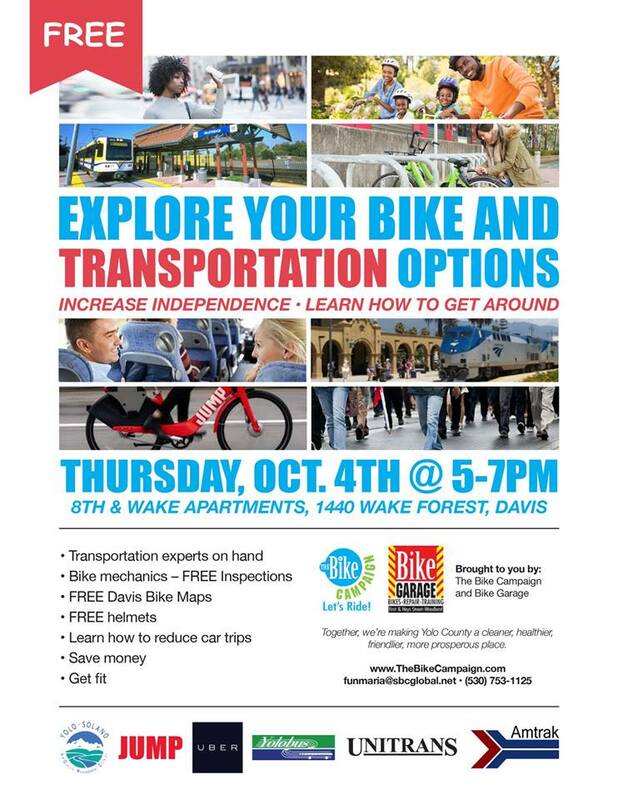 Enjoy events, prizes, and giveaways when you bike, walk or use transit. The goal of Car Free Fall is to encourage people to try something new. So grab your friends and family and ride your bikes, walk to the store, and bus around town. Dates and Times: September 18th and 20th from 10 a.m. to 12 p.m. Details: The City of Davis hosts two bike education events with UC Davis International students to get them ready for living in Davis. The training includes a presentation about the rules of the road and how to bike in traffic. Then students will move through bike check stations including helmet fit, bicycle fit, tire inflation, brakes and shifting, and lights, and reflectors. The training ends with a fun ride to a local ice cream shop. Details: The City of Davis SRTS Program and Bike and Pedestrian Program will be hosting a bike rodeo. Date and Time: September 24th, 5:00 p.m. to 8 p.m. 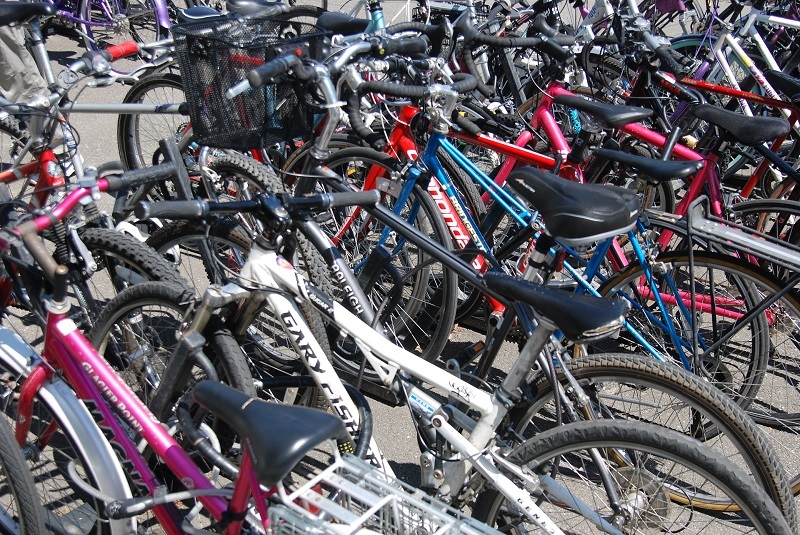 Details: The City of Davis Bike and Pedestrian Program will be providing information about bike safety to first-year UC Davis students at the fair. Date and time: September 25th, 6:45 p.m. to 7:45 p.m. Details: The City of Davis Bike and Pedestrian Program, City of Davis Police Department, and UC Davis Bike Program will be handing out bike lights to people who do not have lights at an undisclosed intersection in Davis. Date: September 28th, 8 p.m. to 9 p.m. Details: Join a casual and fun bike ride around Davis. Details: The Bike Campaign and The Bike Garage is hosting a 2-hour BIKE & TRANSPORTATION CLINIC. These events are open to the public. Details: Schools throughout Davis will be hosting fun events thanking students for walking and biking to school. Date: October 12th, 4:30 p.m. to 7:30 p.m. Details: The City of Davis Bike and Pedestrian Program will be hosting bike valet at Discover Davis. Discover Davis is a fun street event that introduces students to local businesses and organizations in the community. Date and time: October 14th, 9 a.m. to 12 p.m. Details: Biking with Confidence is a new bike education class offered by the City of Davis. Pump up your bike skills and confidence: Whether your riding is rusty or you are proficient on your pedals, this class will teach you how to ride your bike in traffic, the rules of the road, and tips to become a more predictable rider. This course is a combination of classroom and on-street instruction. Participants age 12 and older must bring a bike in good working condition, a helmet and water. Create your account and register with the City of Davis Parks and Community Services department. Details: The City of Davis Safe Routes to School Program and Bike and Pedestrian Program will be hosting a bike rodeo. Details: The City of Davis and UC Davis Arboretum are hosting a tour of oak trees in Davis for the International Oak Society Conference. Date and time: October 26th, 8 p.m. to 9 p.m. Details: The City of Davis and UC Davis will be thanking people for riding the bus at the UC Davis Memorial Union. Date and Time: November 15th, 5 p.m. to 7 p.m.